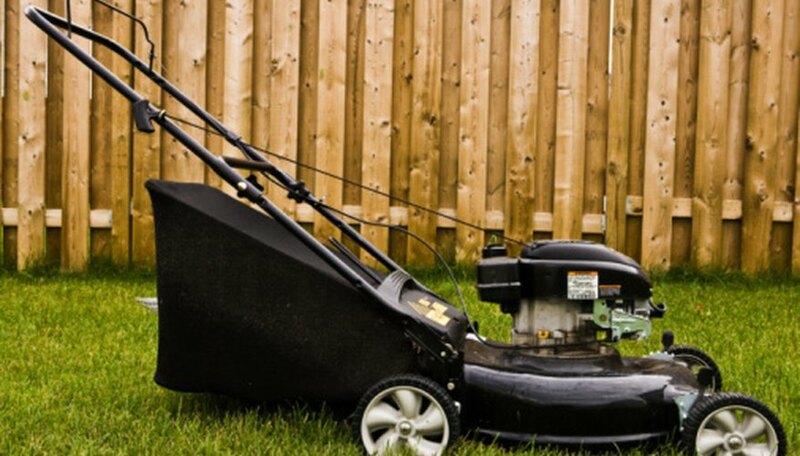 Your lawn mower needs regular annual maintenance to keep it running properly. If your mower engine will not start, there may be a variety of reasons. The most common, however, is a faulty spark plug. When the spark plug sparks, it ignites the fuel in the engine, causing the combustion that makes your mower run. Without a strong enough spark your engine will not start. Generally, a lawn mower spark plug requires an annual check to make sure it is clean and sparking properly. Pull off the spark plug wire from the end of the spark plug by pulling out firmly. Set the end of the spark plug wrench on the spark plug and turn counterclockwise to remove it. Inspect the spark plug for dirt or signs of rust. Wipe the spark plug with a clean rag. Touch the metal hex end of the spark plug to a metal object in your work shop and look for a spark. The metal of the hex, touching another piece of metal, should create a spark. Change the spark plug if the spark is yellow, weak or nonexistent. Check the gap on the new spark plug using the spark plug gap tool. Set the gap using a flat-head screwdriver, slightly bending the metal hex at the end of the spark plug until it matches the gap specified in your instruction manual. Tighten the spark plug down using the spark plug wrench.